Laccolith intrusions and slide mass outcrops, major roads, and towns. The slide masses were much larger than the outcrops shown here, but were later mostly covered by post-slide volcanic rocks or eroded away. Arrows indicate primary direction of slide movement — in all cases, directly away from the intruding laccolith (modified from Hacker and others, 2002). Many Utah geologists have probably driven State Highway 18 in southwestern Utah between Newcastle and Veyo, looked to the east at the pinyon- and juniper-covered terrain with few outcrops, and wondered about the geology concealed in those hills. The old small-scale geologic maps of the area indicate that the rocks are mostly mid-Tertiary volcanic rocks, but reveal frustratingly little about their emplacement or history. Recent detailed mapping and laboratory investigations, mostly by David Hacker of Kent State University, and colleagues Peter Rowley (U.S. Geological Survey, retired; now with Geologic Mapping, Incorporated), Richard Blank (U.S. Geological Survey), and Daniel Holm (Kent State University) unraveled the geology of those hills, revealing a fascinating story of rapid intrusion of laccoliths, with associated arching of overlying rocks, massive gravity sliding, and synchronous volcanic eruptions. In a recent field trip guidebook, Hacker and co-authors explained the story and indicated where the best geologic examples can be seen (U.S. Geological Survey Open-File Report 02-172). Their detailed geologic maps are nearly complete and will soon be submitted to the Utah Geological Survey for publication. Laccoliths are certainly among the most unique and interesting geologic features, and Utah has some of the premier examples in the world. Best known are the Henry and La Sal Mountains laccoliths because of their spectacular exposures, but the Pine Valley Mountains and several nearby intrusions, called the “iron axis” due to the associated large iron deposits, are also world-class laccoliths. The Pine Valley Mountains laccolith may be one of the largest in the world. Laccoliths form as thick paste-like magma (the Pine Valley/ iron axis group are mostly quartz monzonite and granodiorite) forces its way toward the Earth’s surface. However, instead of erupting at the surface to form a volcano, as it nears the ground surface the magma reaches a level of zero buoyancy. Instead of continuing to rise, it then penetrates laterally outward between weak layers of rock, forming a pancake-shaped sill. The overlying rock forms a confining layer much like the leather pieces that form a soccer ball. The sill, which cools enough to have internal strength, but is still plastic enough to not fracture and break, acts like the bladder of the soccer ball. Together the confining layer and the “bladder” prevent the magma from breaking through to the surface. Continued magma injection then “inflates” the sill, doming up the overlying rock to form a bulbous mound. Laccoliths in the iron axis group penetrated weak clay-rich beds in the Jurassic Carmel, Cretaceous Iron Springs, and Eocene Claron Formations, doming the overlying layered sedimentary and volcanic rocks. The new mapping revealed a chain-reaction series of events that followed the intrusions. First, the doming magma fractured and oversteepened the overlying layered rocks. The elevated weakened layers then broke loose and slid down the flanks of the domes as massive gravity slides. The sudden removal of the slide masses produced an immediate large reduction in confining pressure. This then caused still-intruding magma to burst through the seal and erupt, first ejecting vapor-rich (high-volatile) tuffs, then vapor-poor lava flows, which draped across the new gravity slide masses. One of the most interesting parts of the mapping and research was determining the speed and timing of emplacement of the intrusions and slide masses. The rocks themselves are relatively easy to date using the radioisotopic 40Ar/39Ar method. Hacker and colleagues showed that all of the laccoliths in the iron axis area intruded within only about a 1.5-million-year period between 22 and 20.5 million years ago. More difficult was to determine the sequence and length of time of closely spaced events. This required careful mapping of outcrops to determine relationships between intrusive and extrusive rocks using physical correlation (hiking out the outcrops) and crosscutting relationships, combined with radiometric ages, petrology, and geochemistry. Eventually, Hacker and his colleagues were able to establish the link between the intrusions, slides, and post-slide eruptions. Without the detailed fieldwork and mapping, this story would have remained hidden in the pinyon- and juniper-covered hills. Ages and relationships of the outcrops throughout the area strongly indicate that each laccolith intruded and domed within just a few years, or less. The gravity slides probably occurred even faster. Most likely, they were catastrophic events that, once started, happened within minutes, similar to the massive landslide on Mount St. Helens in May 1980 that triggered the disastrous eruption that took 60 lives. It would have been an incredible sight to watch huge slabs of rock several hundred feet thick rush down a mountain slope and run out across the landscape several miles! We do not know if other laccoliths in Utah generated similar gravity slides and eruptions, though it is likely that they did. Most are located on the Colorado Plateau where several thousand feet of erosion has removed the rocks that would be needed to recreate their story. The remnants of several medium-sized laccoliths, massive gravity slides, and post-slide eruptions form most of the hills between Newcastle and Veyo. Hacker and colleauges reported that the largest slide complex is more than 60 square miles, 1,800 feet thick, and extends more than 12 miles from the parent intrusion. As might be expected, the landslide masses were strongly fractured and brecciated, though the stratified rocks maintained their internal structure fairly well. As a result of the intense deformation, the masses erode easily and form relatively subdued tree-covered hills. Much of the story is best visualized with the aid of geologic maps, small versions of which are in the U.S. Geological Survey field trip guidebook (larger versions will soon be submitted to the UGS for open-file release). The best slide mass exposures are in State Highway 18 road cuts 2 to 4 miles north of Central that expose the Big Mountain slide complex. Postslide extrusive volcanic rocks are moderately welded and form many small outcrops but few large cliffs. The best exposures are along the Pinto road (Dixie National Forest Road 009) near Pinto Peak and in the hills surrounding Grass Valley (Dixie National Forest Road 011). The laccolith intrusions themselves are generally the most resistant rocks in the area, and form most of the higher hills. 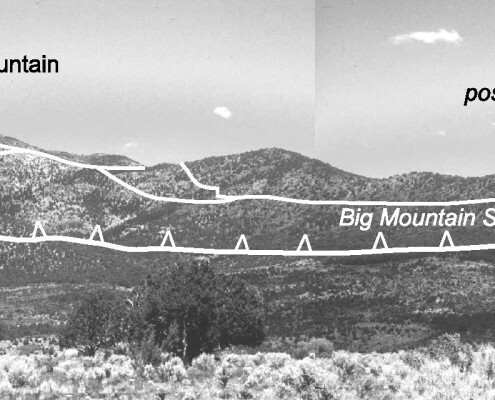 The Stoddard Mountain intrusion is the easiest to access; it is exposed in a road cut about 2.5 miles south of the intersection of the Pinto road and State Highway 56 about 17 miles west of Cedar City. 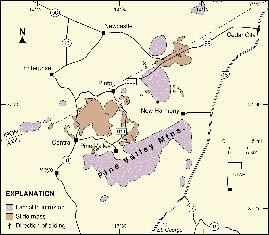 And of course, the spectacular Pine Valley Mountains are the core of the largest laccolith of all. 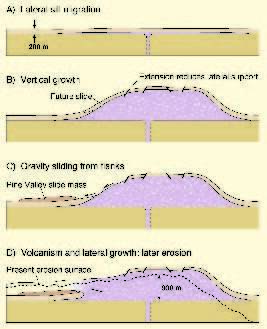 For a detailed discussion of the laccoliths and gravity slides of southwestern Utah, see Hacker, D.B., Holm, D.K., Rowley, P.D., and Blank, H.R., 2002, Associated Miocene laccoliths, gravity slides, and volcanic rocks, Pine Valley Mountains and Iron Axis, southwestern Utah, in Lund, W.R., editor, Field guide to geologic excursions in southwestern Utah and adjacent areas of Arizona and Nevada: U.S. Geological Survey Open-File Report 02-172, p. 235-283 (http://geopubs.wr.usgs.gov/openfile/ of02-172). Thank you to David Hacker for his assistance with this article.